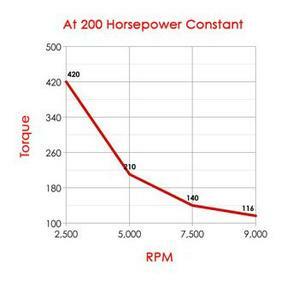 FAQ: What is the difference between Horsepower and Torque? If you are thinking about improving your car’s performance by bolting on anything from an intake and exhaust to fully rebuilding your engine with different cam’s or pistons, it is very helpful to understand the relationship between torque and horsepower. The trouble with talking about the difference between the two is that there isn’t that much of a difference really. In an internal combustion engine, when you ignite your air/fuel mixture, this causes the gas trapped in the cylinder to expand rapidly, and push the piston down. The piston is connected to the rod, which is connected to the crank, and as the piston is pushed down, that forced is translated to the crank. The twisting force exerted on the crank is also referred to as torque. Or, to simplify things, Torque is the amount of force the piston is pushing down with. So what is Horsepower? Horsepower is a measure of the amount of Work the engine does over a given Time. This actually tells us a lot of interesting things. The first is that at 5252 RPM, an engine’s Horsepower should equal its Torque. I think that you will find that if you look at pretty much any dyno plot of any car, the torque curve and horsepower curve will cross right around 5,200 rpm’s. The next is that no matter how much torque our engine makes, the amount of horsepower that it produces is directly dependent on how fast the engine is spinning. Ever wonder how a Honda S2000 can make 230 Horsepower, but less than 200 Ft Lbs. of torque? Well, the early 2.0 Liter S2000’s have a 9,000 rpm redline. If it is spinning that fast, it doesn’t have to produce a lot of torque to make a lot of power. If you plug 230 horsepower and 8,000 rpm’s into the equation above, you should find that you only have to make 150 Ft Lbs. of torque to generate that much power. Now, the flip-side of this is a diesel truck can make 1000 Ft Lbs. of torque, but only makes 500 – 600 horsepower. This is because a typical diesel engine might have a redline of only 3,500 rpm. If you plug in 1,000 Ft Lbs. of torque, and 2,000 rpm’s in to the equation above, you should see that you would only be making about 380 horsepower. Lastly, what this means is that there is no reason that an engine will make its maximum horsepower when it makes maximum torque. So if we want to make more horsepower, we really have two choices. The first is to make more torque at a given rpm. The second is to make our torque curve fall off more slowly, or in other words to make more torque at a higher rpm. And actually, if we could get our engine to make the same amount of torque over a wider rpm range, that would also produce more horsepower. What this shows is that at a lower RPM, an engine must produce substantially more torque to produce a given amount of horsepower than it does at a higher RPM. 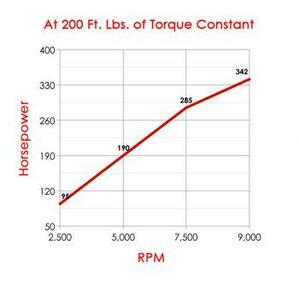 This shows us that if an engine can produce the same amount of torque at a higher RPM, it will produce more horsepower.